During Monday lunch period, Wealthy Elementary students are encouraged to take off their shoes, stretch, breathe and relax. Yoga teacher Brooke Dillane gathers up about 25 girls for a session spent in Tree, Warrior, Child’s and other poses. 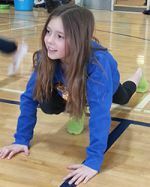 Dillane started the yoga club, open to fourth- and fifth-grade girls and boys, in January. 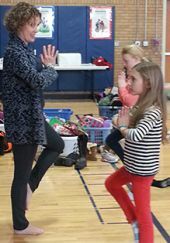 Dillane, a certified instructor at East Grand Rapids-based Seva Yoga, has taught yoga in gym class at the school, but it didn’t always fit into the curriculum. She said she wanted to make it an ongoing opportunity. She also taught at an East Grand Rapids High School yoga club. “ It’s beneficial to start yoga at a young age, and the students love the different names, like ‘Sun Salutations,'” she said. They like the chance to stretch and relax during a busy school day. “It’s so much easier to start at eight or nine than forty-eight,” said Dillane, whose daughter, Georgia, is in fifth-grade at the school. “The main reason I wanted to bring it to the elementary school is they are sitting so much in class, their posture suffers,” she said. Poor posture can lead to health problems including misalignment and pain. Benefits of yoga include improved flexibility and strength, the ability to “center” oneself in the body through breath and calm the central nervous system. “It also builds community,” Dillane said. Students stretched into many different positions before ending in a relaxation pose. “If I had a really stressful day in class it helps me relax,” added fifth-grade student Norah McLaughlin.